Since reading The Life-Changing Magic of Tidying Up by Marie Kondo, I have been taking about 10 bags a day to my local Salvation Army and Interfaith Wardrobe. (Have you read that book yet? Seems like it was THE book of 2015 of those who read like they Pin… love the idea but will I ever do it?? At least that’s how I Pin!) Anyway, the problem is that I can’t drop a bag off (or 20) at Sal Val without going inside to see what new, cheap treasures may be waiting for me. Surely this negates the premise of Ms. Kondo’s book but I can’t stop myself. They’re about 6 inches tall and have beautiful brass detailing at the bottom. Up next, a solid brass lamp. This lamp is a beauty. Heavy. Like “Colonel Mustard did it in the library with this brass lamp” heavy. I like how shiny it looks with the lamp on. Classes up the joint all for $9. So that was Round #1 for the night. 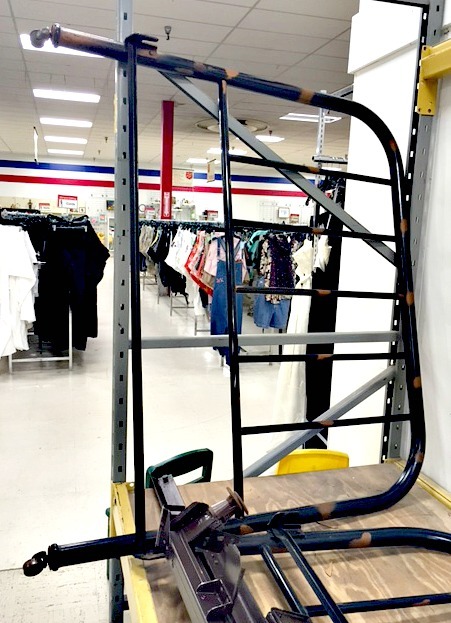 But then I spied a full sized brass bed frame spray painted black for $19. And it had to come home with me too. But I wasn’t sure if all its parts were present so I had to do a consult with the Boss. Normally when I have to consult with the Boss, I usually have to prepare The List of why I need something. But when he heard the bed frame only cost $19, the financial planner in him realized that this was not a risky proposition and guaranteed him my adoring love at least for the night so back we both went to Sal Val and took it home too. I was planning on buying my daughter a new bed frame for her birthday so for $19, this was a huge score. We will spray paint it a satin black as soon as the weather is above 50. I’d like to think we will spray paint it together. Mother-daughter bonding. Instilling a love of all things junk in her. Laughing as we go. Can you picture it? I can only dream..
Now this is what I didn’t buy. What I could’ve, should’ve, would’ve if it had been a different day. I told you — Sallie’s was hot that night! 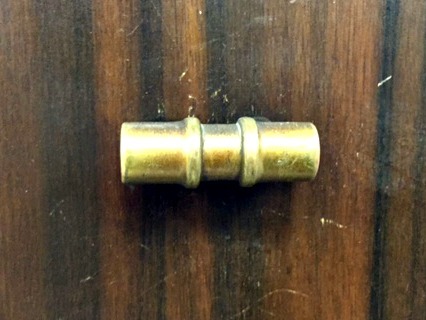 This dresser had cool details like the herringbone design on the drawers and these amazing pulls. I took a close-up. The dresser was priced to sell at $50. Was almost tempted just for the 8 pulls. 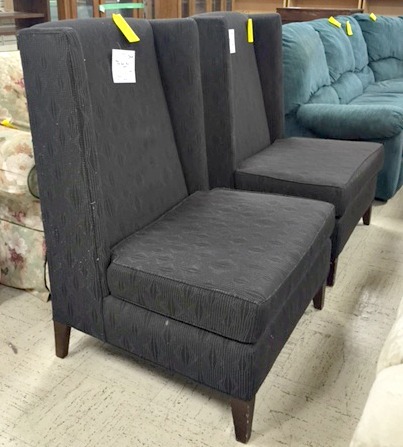 Next I spied these black, upholstered, high-backed chairs. 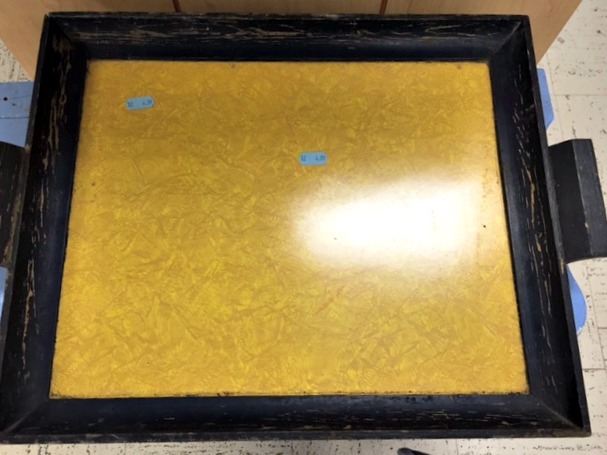 The crafter in me almost bought this tray. But I didn’t. Another way that reading that Magic of Tidying Up book has changed me. 1 less tray on the shelf. Although now that I’m seeing it again, I’m thinking greyish-beigeish spray paint. Candles. Or maybe those new copper candlesticks I did buy. I better stop thinking about this. Speaking of those candlesticks, I used them for our fancy Sunday night dinner tonight. Can you see them shining on the table? Look hard. They’re right behind the Heinz ketchup bottle tilted upside down to get the last drop. That’s how we do fancy. See. I told you they had high backs. But I am pretty short. 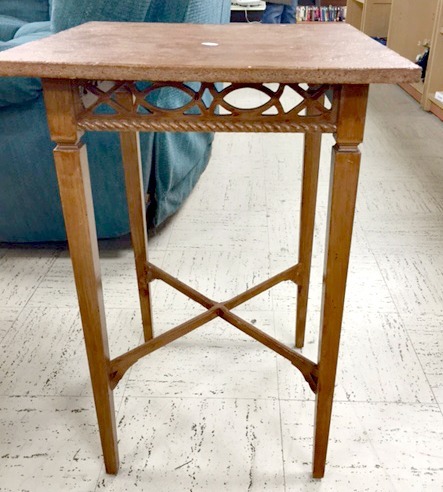 What have you found thrifting recently? And, should I buy the chairs?? I want to go to Sallie’s right now…but I need to read that book and fill a few bags first! Wonder if that table’s still there??? It caught my eye! Excited to add this new home and lifestyle blog to my feed! Can’t wait to see how that bed turns out! I think we could be friends!! I want to go with you. Are you free this weekend? I want to go to Sallie’s with you now! I think we could be friends!! But first I need to read that book and fill a few bags to tidy up! Looking forward to future posts! Haha I am loving this! You got a website and it’s great! But now I NEED that dresser and I feel like I need to take a trip to our local Sal Val ASAP!!! haha you’re right I probably would have had quite a moral dilemma given the chance to purchase the (dirty toxic) couch! Also sorry for my double comment posting, I got a little overly eager! I love your Toxic Tuesday posts. It really makes me think about what I buy. What is that velvety upholdstered thing in front of you?! I think I am going to have anxiety about it, it looks like I need it haha! Ps I love that you have a blog now! Except now I want to go bargain hunting haha! Maybe this is good?! I would love to shop with you anytime. Except I wouldn’t shop. Just hold your beautiful babies! Oh Angie – I love your first post! I will make sure to follow! I can’t wait to read about all of your adventures! Best of luck! Oh Angie ! A girl after my own heart! I didn’t know. I just bought a leather chair from Sally’s and I love it! 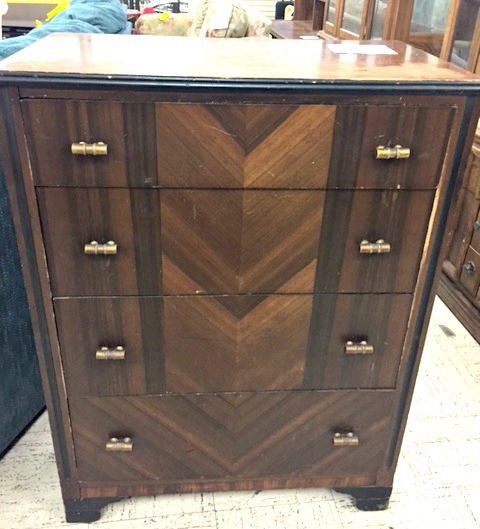 I also purchased Frank’s dresser from there. I stripped it and you should see how beautiful it is. It is a wonderful large oak chest of drawers – thomasville when they built their furniture in the states. I also bought my new tv stand from there and painted it a beautiful cream. I’m looking forward to the weather getting warm so I can start working on some projects that I want to do. Hi Ellie, Thanks for reading! I didn’t know you were a junker too! I would love to see a picture of Frank’s dresser and the TV stand. They sound amazing!! Finally an Angie blog!! Yeah!! A little worried about exposing our town treasure to too many talents, but loved your post and your finds!!! my grammar/spelling these days in great. in case you can’t tell! i’ll stop commenting all over your blog now! Please keep commenting — I love it! Haha! We became friends through our daughters. Sophie and Madison. Love it—one of the most talented women I know sharing her gifts with the world!!! Ahh..you are the sweetest! Miss you much!! I’m going to have to follow you now! I love going to Sally’s and I just bought a white metal cupboard there tonight to refurbish. Also starting a big hutch over haul at my house! Great blog Angie! Thanks Jamie! Can’t wait to see what you create! Thanks for following my blog! I have a big announcement on Sunday!